When you start climbing through the vineyards in Nebbiolo, Barbera and Dolcetto, what you find in front of you are the most genuine and deep Langhe in all their majestic splendor. It is an uphill road that leads to Treiso, a small village in the Bassa Langa located at the meeting point of five hills, overlooking the valley between the torrents Tinella and Seno D'Elvio, where there are some of the most famous vineyards in the world. And it is here that the Rizzi Hill is located, hanging over the vines of this territory, in the heart of the Barbaresco and Langhe area. 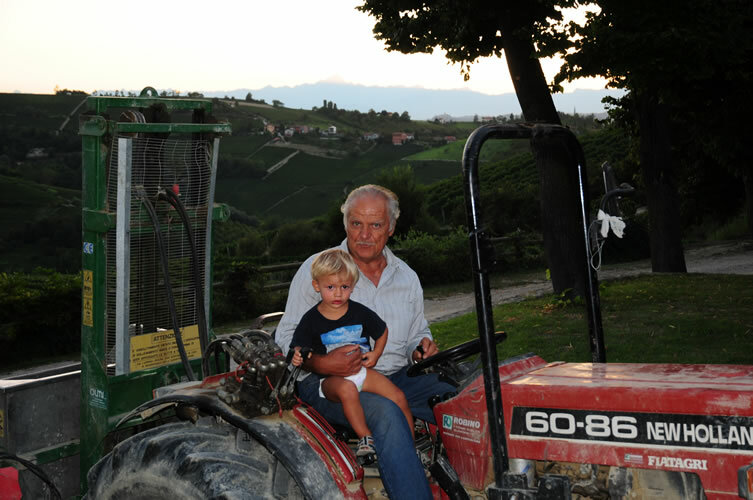 Here, over 40 years ago, the love for the vineyard and its fruits, led Ernesto Dellapiana, together with his wife, to leave the city of Turin and his career as an entrepreneur and return to the lands that have always belonged to the family to devote himself to the countryside and life as a farmer. In that period, producing wine was not as "easy" as it is today: the custom was to plant wheat and not grapevine, the roads were not paved, making connections difficult and the villages were isolated from each other. But Ernesto Dellapiana was driven by passion and the dream of creating something important. 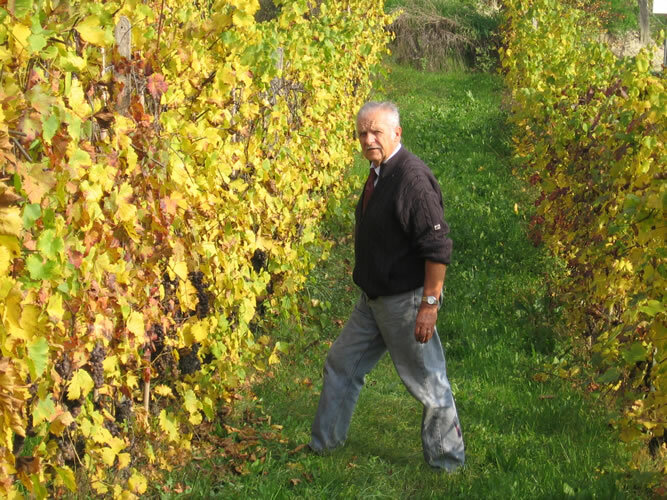 IT IS ERNESTO DELLAPIANA THAT IN 1974 BEGAN, WITH THE FIRST YEAR OF PRODUCTION, THE ADVENTURE OF THE RIZZI WINERY. Rizzi farmhouse and its vineyards on the two sides of the hill (Cru Rizzi) and Cru Nervo (a four-hectare plot under the village of Treiso) they are the starting point, the solid and secure base on which the foundations of the Company lay. Afterwards, the commitment and the desire to grow came, always remaining linked to their own Territory and to the philosophy of work that never becomes purely business, but maintains the family character of those who choose to carry on a "human scale" activity "and tie it to the purest and deepest feelings. These are years of effort and acquisitions, which lead the Rizzi Winery to expand: in 1984 with the addition of the Boito farmhouse and the adjacent Vigna Boito, still inside the Cru Rizzi, and in 1997 with the purchase of the Manzola farmhouse and its vineyards. Between 2004 and 2018 new acquisitions were made: three hectares of the vineyard in the Cru Pajorè, 5 hectares of Podere Stella at Neviglie and finally 1.5 hectares in the Cru Giacone and 3 hectares of the Cru Bricco di Neive. Ernesto Dellapiana works to improve his company both from a quantitative and a qualitative point of view. 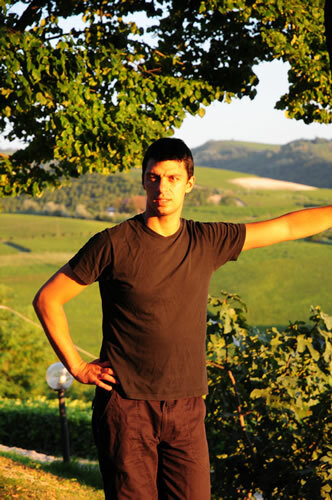 And so the dream becomes reality and the Rizzi Wine Company reaches over 44 total hectares divided between Nebbiolo da Barbaresco (the most substantial part), Barbera, Dolcetto, Moscato, Freisa, Chardonnay and Pinot Nero. 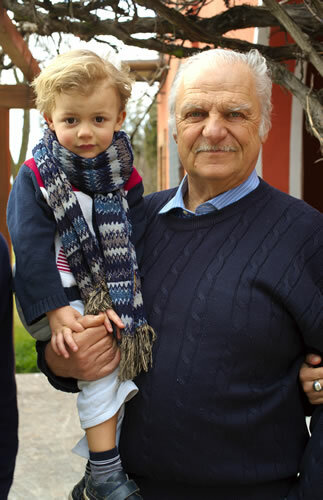 Over the years, Ernesto and his wife Lia are joined by their two children: Jole, graduated in educational sciences, with specialization in the field of marketing, administration and public relations, who deals with the commercial and management part of the winery and the sales network, and Enrico, graduated in Viticulture and Oenology at the Faculty of Agriculture of the University of Turin, engaged in the technical management of the farm and the winery, following all the problems of production, trade, sales network and export of wines. 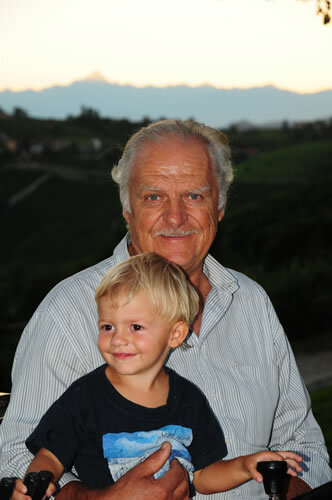 Past and future, but also tradition and innovation that come together for a family-run company that sees old and new generations working together side by side to bring the name of the Rizzi winery and its wines ever higher up in the world. There is passion, commitment and dedication in this family that has been able to exalt the "fruits" of its territory, always remaining tied to it. 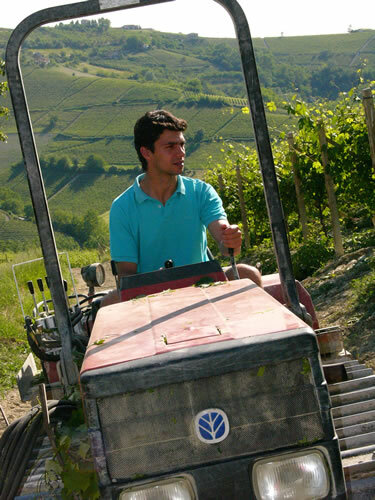 Even after more than 40 years of activity, the philosophy of the Rizzi winery remains focused on classicism and tradition, with great attention to respect for the environment and the ecosystem, through the use of pellet manure, compost and green manure for fertilizers, and copper and sulfur to combat fungi and pests. Furthermore, only mechanical techniques are used to keep the sub-plates clean. The ultimate goal is always the same, generation after generation: to exalt in wine what the season and the territory have been able to express in the fruit. 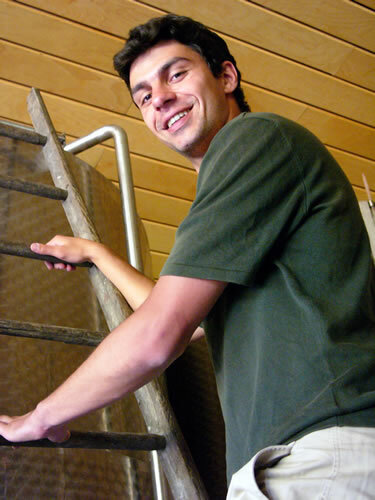 The result is excellent wines and a variety of labels that stand out for their consistency, quality and reliability. Those from the Rizzi winery, from the Barbaresco to the Barbera, from the Dolcetto to the Moscato d'Asti, ending with the bubbles, are wines to be discovered one by one, certain of the fact that for nothing in the world they will disappoint you. Nowadays, the Rizzi company comprises as a whole three individual farms confined to each other, within the municipality of Treiso, and a fourth in the Municipality of Neviglie. It is the true core and heart of the company, administrative headquarters and headquarters of the wineries. The name Rizzi derives from the Piedmontese "Riss", or hedgehogs, the small and pretty thorny animals that populated the undergrowth and were very common in the area. The Rizzi farmhouse, built at the end of the 18th century and which has always belonged to the family heritage, is located on the ridge of the homonymous hill, from which it took its name. Already in the 1898 map of Prof. Domizio Cavazza, dean of the enological school of Alba at the end of 1800s who was the first to promote Barbaresco wine, Crü Rizzi appears as one of the suitable areas for the production of Barbaresco wine. The soil condition (white limestone marls), the position of the hill, lower than the surrounding hills and therefore more sheltered from the currents and bad weather, so as to create a real microclimate, the perfect exposure of the vineyards to sunlight, translate into wines of the highest quality and pleasantness. Nebbiolo da Barbaresco, Barbera, Dolcetto, Chardonnay and Moscato. The Boito farmhouse, adjacent to the Rizzi farmhouse, is the other heart of the farm. Its vineyards seem to besiege this beautiful eighteenth-century farmhouse (typical example of Langa architecture) which is the last high bastion of the Rizzi hill. From its 300 meters of height the farmhouse dominates the valley and the vineyards that surround it. Nebbiolo for Barbaresco, Barbera, Dolcetto, Chardonnay and Freisa. Already famous in ancient times, in the Roman times, Villa Manxionis, now known as Manzola, was an important stopover station on the "Magistra Langorum" road that, passing through Treiso (from the Latin Tres), connected Alba Pompeia to the sea. Horses and carriages that came from Asti and Incisa and other neighboring towns in the area, stopped at Villa Manxionis to be cleaned up, put in order; the travelers were refreshed, rested, and then entered Alba to be received with honor and curiosity. The vineyards of Farm Stella are located in Neviglie, a small town surrounded by the municipalities of Barbaresco, Neive, Mango and Treiso, in the heart of the area of uscat production. It is no coincidence that the vineyards of the Farm (5 hectares) are mainly cultivated with Asti muscatel.The soil is clayey-tufaceous, rich in limestone and the area is ventilated by the shape of the hillsand altitude varies from 360-420 m. a.s.l. ; the exposure is south, south-west.